Note: The makers of Pathfinder (Paizo) and HeroLab (Lone Wolf Development) are not responsible for the Yarnblobs pictured above. While they are makers of cool products, I don't think they knit. We're not currently playing Warhammer 40k, though I do like some of the minis. I've got their 2010 catalog, which has some really neat, very well-painted stuff. We may eventually try to play since there's often a game going on at Madness, the game store we frequent. The armor is actually painted pearl white, thought it's difficult to see in the photos. The discerning eye will note some loss of detail in the final painted version. This is due to some remaining old paint we couldn't get out of the crevices, especially at the knees and between the armor and cloak. 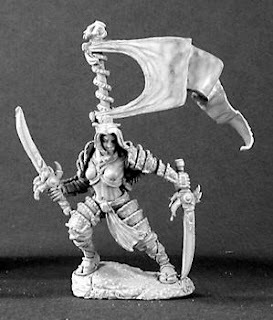 I used this mini for one of my favorite characters ever - Saille Siannodel, frequently referenced in my Hubby's blog under the preservational posts for the Valley of Obelisks campaign. The "epilogue" post for that campaign can be found here. As I recall, I actually fretted over her paint a great deal, as we had already begun the Valley of Obelisks campaign and I knew I was going to use her for that character. She was probably my first real attempt at shading, hair, faces, etc. so I had loads of trouble, but in the end she looks exactly like I envisioned for this character. 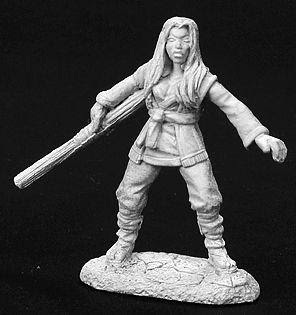 For you gamers, she was a rogue-monk thanks to the Ascetic Rogue feat in the 3.5 rules. This high-tech gem is a resealable sandwich bag with one of the lower corners cut off. The yarn is fed through the hole, and the friction and small size of the bag keeps the yarn reasonably contained but able to spin enough to get the yarn off the core. The two on the left are dark elves (evil) and the one on the right with the sword is a Paladin (good; sort of a knight for non-RPG'ers). 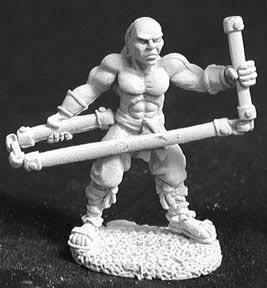 Since these are just primed and not yet painted, they're a little hard to see. Basically, you've got the evil queen in her throne and her evil cleric casting a spell from a book perched on an undead minion (skeleton, head not yet attached). 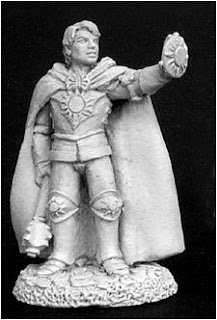 On the other side you've got the Paladin pausing for a moment to consider which evil to smite first. My Hubby and I were discussing the base (which will need to be bigger than this 2.5" job they're sitting on), and thought it might be cool to have a spider swarm or something crawling out from where the evil cleric is casting, heading toward the Paladin, trying to make it past her aura of good. I'm actually open to suggestions on the setting. So far my plan is to paint the minis and then figure out what to do with the floor so they won't either disappear into or clash with the setting. I post this because I've been planning to put the queen in some sort of setting for awhile now, but didn't think about the little diorama with the evil cleric vs. the Paladin until this past weekend and I don't want to forget. I admit, I even pulled all my paladins out of my display cases to "audition" them. Let's pretend I wasn't playing with tiny metal dolls, 'kay?